So we had some bananas that had browned up and of course the kids wanted nothing to do with them, which is fine by me because that’s when they’re best for baking! 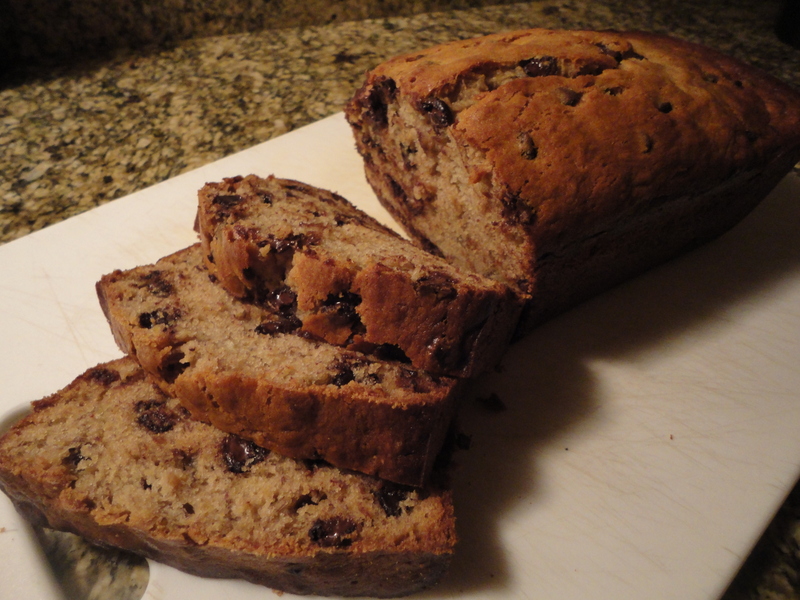 I decided to whip up a little chocolate chip banana bread, and it went over like a champ with the wife and kids. I even brought half the loaf to my son’s end of year football party… Yeah, the parents finished it off before the kids even knew it was there. LOL. Serves: A lot of hungry people. In a mixing bowl cream the sugars and melted butter until a mousse is formed, then add the egg, vanilla extract and mashed bananas and mix well. Add the flour, baking soda, baking powder and salt, mix until a batter is formed. Stir in the chocolate chips. Pour the batter into the greased loaf pan. Bake for 50-60 minutes, or until a toothpick inserted into the center comes out clean. All to cool at room temperature for least 15 minutes before cutting and serving. It really doesn’t get much easier, and more delicious, than this! Tags: banana bread, chocolate, chocolate chips, delicious, perfect pairings, perfect pairings at home, sweets. Bookmark the permalink.